Do YOU Connect with Content, Search, Social and Local? Now YOU Can! We share this information through blogs, videos, social media and events! Speaking of events …. On October 23rd we are hosting the second annual Local Social, an event created to connect the business community with industry leaders, and support Traumatic Brain Injury Survivors through TryMunity. We invite you to join us! You will glean invaluable information from the search, social and content industry keynote speakers Mike Grehan of Acronym; Larry Kim of WordStream; and Daniel Wu of Baidu/Gridsum, who is traveling from Beijing for the event. Pamela Parker of Search Engine Land; Jerod Morris of Copyblogger Media; Loren Baker of Search Engine Journal; Andra Dunn of the DFW American Marketing Association; John Nosal of the DFW SEO Group; Greg Gifford of the DFW Search Engine Marketing Group; Mark Barrera of the Social Media Club of Dallas; and Alfred Van Hoven of DFW Interactive Marketing Association. Event moderators will include Bernadette Coleman, author of Online Marketing for Local Businesses – A Beginner’s Guide; Lissa Duty, author of Your LinkedIn Professional Network and 25 Tips to Twitter Success; and Rob Garner, author of Search and Social: The Definitive Guide to Real-Time Content Marketing. Going back to the first question – Do YOU Connect with Content, Search, Social and Local? Whether your answer is YES or NO, this event is for you! There is always the opportunity to learn something new or expand your knowledge base with the ever-changing digital landscape. We will have food, fun, and a ROCKing after-event. 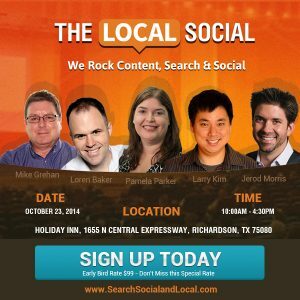 Visit SearchSocialandLocal.com to learn more and register! Early registration ends October 17, and remember you are not only learning at an event like this, but rubbing elbows with the Who’s Who in digital marketing. Plus, 100% of the proceeds support TryMunity. Email LDuty@AdviceInteractive.com if you have any questions or are interested in sponsorship opportunities. Home BlogDo YOU Connect with Content, Search, Social and Local? Now YOU Can!